Bluetooth speakers have long been an easy and inexpensive way of subjecting those around you to the compressed music files on your phone and some of these wireless wonders do it better than others. The Ruark Urchin, Beats Pill 2.0 and Jawbone Big Jambox, spring to mind, but to be kind to them, they're definitely not hi-fi. With its limited range and lossy compression connection, you couldn't really expect any more from Bluetooth…or could you? Dali, the Danish speaker specialist believes in Bluetooth enough to launch the £645 Kubik Free and its optional stereo extender, the Kubik Xtra (£295). Without AirPlay, or a hardwired input for your phone, it's Bluetooth or bust. 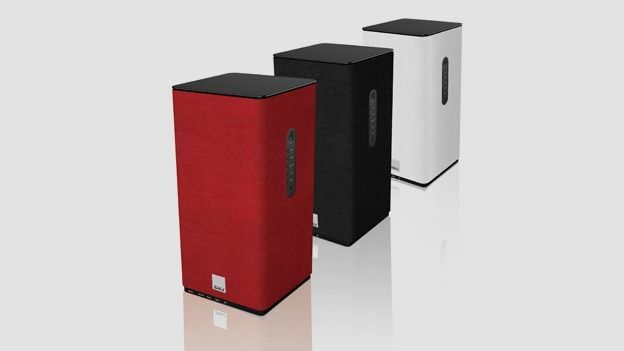 The Kubik Free and its similarly styled sidekick are the largest Bluetooth speakers we've encountered, standing tall at 30.5cm with the heavier active speaker weighing in at 4.5kg. The footprint, however, is a more manageable 14.5cm square and with nine different wrap-around cloth grills to choose from, they should blend in anywhere. The build quality is exceptional, with bolted brushed steel and aluminium panels holding the drive units and digital amplification fast. With a good solid speaker stand to sit on, the speaker's rubber base ensures almost zero cabinet resonance. Aside from the usual inputs you might expect to find on a wireless speaker - analogue, optical and USB - connections are thin on the ground. Most surprising is the absence of a port for your iPhone, or any phone for that matter. The front USB is for charging only, and the rear is a microUSB slot that will only recognise a Mac or PC. So if, like us, you have a collection of test tracks at varying bit-rates stored on a USB flash drive, you're plumb out of luck. And without AirPlay you're forced into an analogue, or Bluetooth connection, which both compromise audio quality. But what you do have, that other Bluetooth and even AirPlay speakers tend not to, is an output for daisy chaining a slave speaker, enter Kubrik Xtra, and a switch to have them play together in true stereo. Getting started couldn't be easier. Just plug in, turn on and activate the wi-fi on your phone. We had no problems connecting an iPhone 5S, Samsung Galaxy Note 3 and MacBook Air. You just have to remember to log off with one device, before joining the next. Also keep in mind that Bluetooth begins to crap out at ten meters and even in the same room, we experienced the odd dropout and there's nothing more jarring when you're listening to music at full tilt. For an unshakable connection and/or high resolution audio playback, switch to the wired optical input. Beneath their felt grills, the naked Kubiks look like a conventional pair of speakers with soft dome tweeters positioned above wood-fibre mid-bass drivers and this is why they sound so much better than Bluetooth speakers shaped like a pill, or a turtle or a bar of soap. Placed around six feet apart on two speaker stands, team Kubrik have the power and poise to create a very convincing stereo image and a thrillingly dynamic soundstage. As a pair the Kubiks are greater than the sum of their parts, but even taken individually, the Kubik Free sounds impressive. Dali has been making speakers since 1982 and has chosen drive units capable of picking out instruments and punching out basslines at both low and very high volumes. The result is a warm, engaging sound that's full of nuanced detail and is a joy to listen to. There's plenty of power on tap from the 100W class D amplifier too and enough bass to drive a large room. It's unlikely you'll need to add a subwoofer to the pre-output anyway. Perhaps the upper frequencies could reach a little higher, but not much. By the time you've plugged in a mains cable and the umbilical link between the two Kubiks and perhaps USB and optical cables, this ceases to be a wireless system, but among the myriad Bluetooth boxes on the market right now, this is the best we've heard. Of course, it's also the most expensive and we're still struggling with that. Bluetooth uses lossy compression and was only meant to be a solution in situations where wi-fi or a cable wasn't an option. Kubik is clearly designed for the home where your wi-fi lives and cruelly, there's no cable input for your phone. Cambridge Audio offers Bluetooth and AirPlay on the £249 Minx Air 100, so why doesn't Dali? If there is such a thing as Bluetooth purist, they will surely love this product.